These unusual denominations can be traced to back to the act of September 18, 1834. 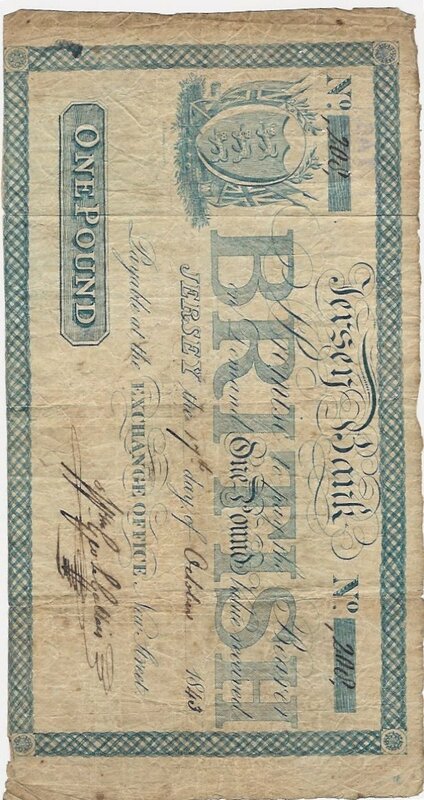 This act decreed that English money would be the sole legal tender in Jersey. At that time, 26 French livres were equal to one English pound. With 20 shillings to the pound and 20 sous to the livre, one shilling was worth 26 sous. Thus the Jersey penny or pièce de deux sous became 1/13th of a shilling, the Jersey half penny or sou 1/26th of a shilling, and the farthing or pièce de deux liards 1/52nd of a shilling.1 One additional thing of interest about this act was that no one was obliged to receive in payment more than the value of one shilling in copper money. Mintages for these coins are typically small. For a quick look at the mintage figures, visit the “Mintage Information” site. There are various die varieties for most of these coins. Review the “The Rarity of Various Jersey Coins” site for this information. The initials of WW for William Wyon are on the truncation. Mintages for these coins are typically small. There are various die varieties for most of these coins. On the 1841 coins, the last one in the date is struck over a zero. The obverse die was also used for the Gibraltar 1841 proof one quart and the 1842 one quart circulation issues. The effigy (but not the legend) appears to be the one used on the 1839 Isle of Man farthing. There are proof examples for both issues. However, the 1861 issue is a proof only issue. For the 1861 coins, examples exists in both copper and bronze. The bronze proof coins are extremely scarce. A variety of the 1858 issue has a die crack across the 6 on the reverse. On finer examples, striations are visible on some coins for each year due to die clashing. If you look closely, on most issues many letters are repunched. Proofs exist for the 1841, 1858, and the 1861 issues. As with several other Jersey coins, there seems to be a difference of opinion on the correct mintage figures for the Jersey 1844 penny. In his book, The Coins of the British Commonwealth of Nations Part 1, European Territories, Major F. Pridmore states that the mintage of the 1844 Jersey one thirteenth of a shilling as 27,040. The 1841 had 116,480 coins minted, while the other issues each had a mintage of 173,333. This would make the 1844 the key of the series. Krause and other leading publications have repeated these numbers. However, according to Royal Mint documents, the correct mintage figure is 145,600. Thirteen Jersey pennies have the same weight as 12 English pennies, i.e., 1 pound avoirdupois. Some 1841, 1844, 1858, and 1861 issues have a hair-line die crack from the truncation to and sometimes across the V of VICTORIA. On finer examples of the 1851, 1858, and 1861 issues, striations are visible on some coins due to die clashing. Several different “1/13 fractional” varieties are known to exist. There are various styles of digits for these coins. For all the issues, proofs were struck. All of the 1865 coins are proofs. This medal commemorates the 1846 visit of Queen Victoria and Prince Albert. 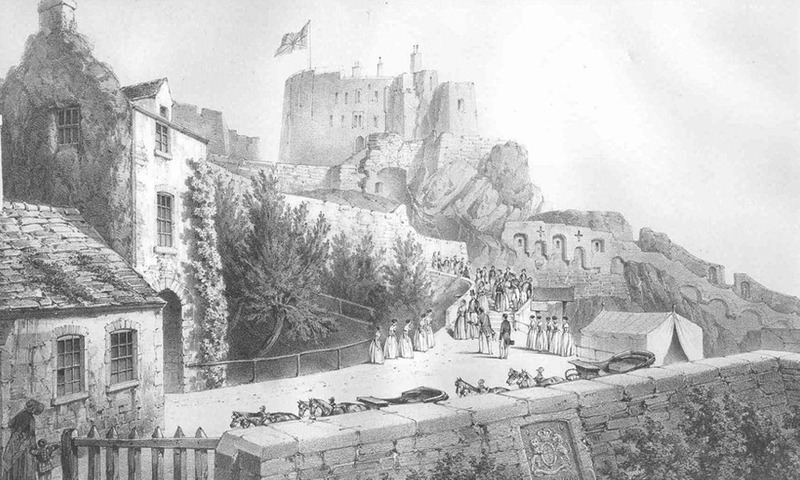 “The coinage and banking operations of Jersey offer some salient points to the curious. At the present, Bank of England notes, English and French gold and silver, and a local copper money form the staple currency. Formerly, French silver and copper, among the former of which the six-livre piece was prominent, were almost the only medium of exchange, and these coins, at the best of times, were very scarce. 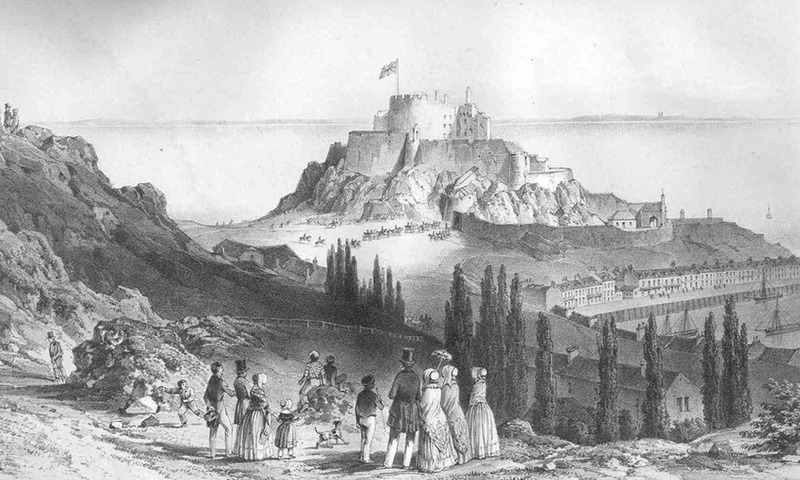 To supply this deficiency, early in this century the States of Jersey had three- shilling and eighteen-penny pieces, of local value, coined at the Royal Mint, but these were withdrawn in 1834. The insular currency was framed on the old French system—the sol or sou being a halfpenny, twenty sols one livre, and twenty-four livres one Louis d'or. In the Extentes, or Royal Rent Rolls, as well as in private account books of the olden time, reference is made to deniers and liards—one the twenty-fourth, the other the quarter of a sol. In the Guernsey special coinage the latter exists, and is almost as great a curiosity in its way as the new French centime; the former never was a coin, but merely a hair-splitting instrument of computation. Monnoie d'ordre appears in the publication of some fines in the last century. This had the effect of raising the livre fifty per cent., by means of an order in Council, dated 1729, and was iniquitously procured by certain local capitalists to depreciate the value of real property. The term is used in contradistinction to the livre tournois, or cours de France. 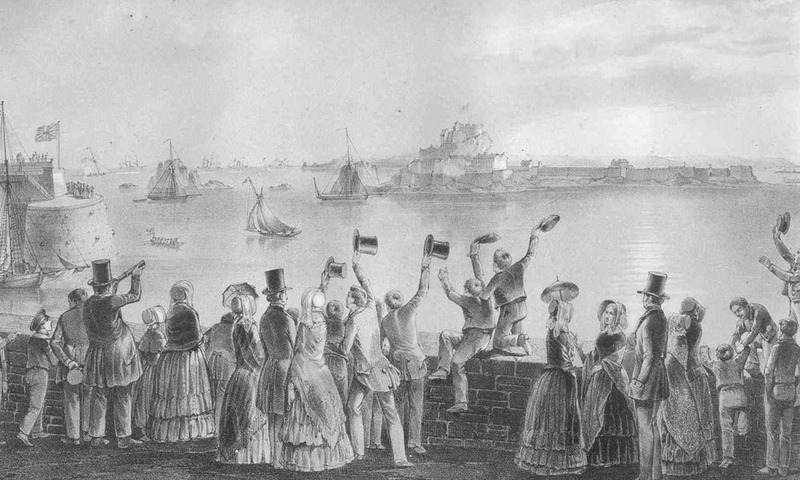 Before 1841, the numismatist whose ambition did not rise higher than copper would have made hay triumphantly in Jersey, for it seemed that the Island was the universal refuge for all the “browns” of the universe. 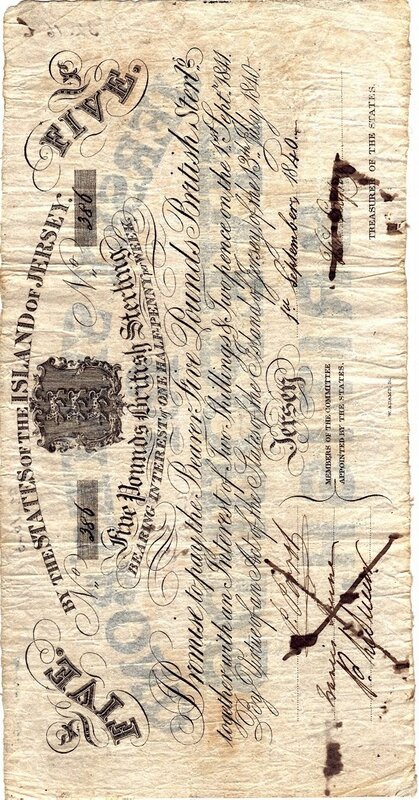 Imported wholesale, as a profitable speculation, by the native sailors from every country in the world, the Jersey people were so cosmopolitan in their ideas of what constituted a penny or a halfpenny, that flat discs of metal, innocent of die, passed freely in the ruck of this motley circulation. However, in the year mentioned, the Crown waived its prerogative, and permitted the States to issue its own pence, halfpence, and farthings. These, in accordance with the local system of calculation, were struck at the rate of thirteen pence to the English shilling, being a premium of 8 1/3 per cent, in favour of the latter. With the additional advantage of the Jersey pound avoirdupois, being 17 ½ ounces, money went far, but although the latter still remains as a boon to the buyer, almost all articles of necessity and luxury are bought and sold at English rates, or at so much “British!” as the Jersey Rothschildren say. From “The Gossiping Guide to Jersey” by J. Bertrand Payne, 1865. 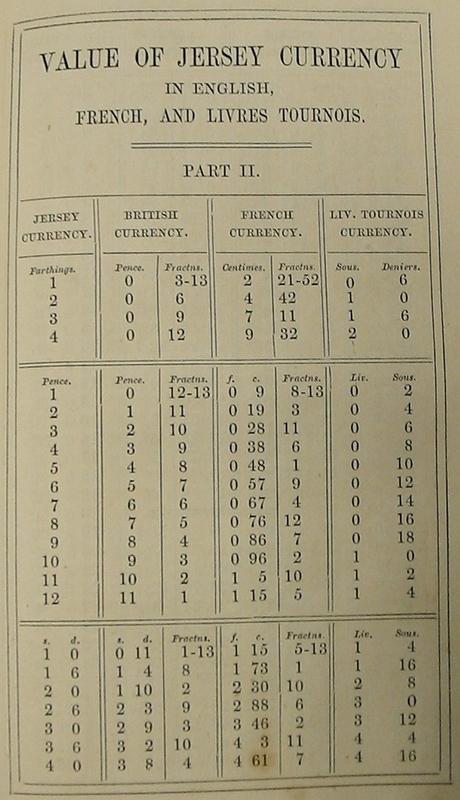 From the booklet “Comparative Value of English, Jersey, French, and Livres Tournois Currency, to which is added the Value of Rentes in Jersey, rendered in four currencies” by C.A. published Jersey 1854. 1. A. L. T. McCammon, Currencies of the Anglo-Norman Isles (London: Spink & Son Ltd., 1984), pp. 155 and 156. 2. Fred Pridmore, The Coins of The British Commonwealth of Nations, Part 1: European Territories (London: Robert Stockwell Ltd., 1960), p. 46. 3. Lobel, Davidson, Hailstone, and Calligas, Coincraft's Standard Catalogue of the Coins of Scotland, Ireland, Channel Islands & Isle of Man (London: Polestar Wheatons Ltd., 1999), p. 315. 4. Lieutenant Colonel B. Lowsley, The Coinages of the Channel Islands (London: Victoria Printing Works, 1897), p. 31. 5. Fred Pridmore, The Coins of The British Commonwealth of Nations, Part 1: European Territories (London: Robert Stockwell Ltd., 1960), p. 46. 6. MINT 1/39, Entries include: Minutes and memoranda of the Master, 1843 May - 1845 August; Orders of the Privy Council, 1844 January and 1845 April; Representations, reports etc. submitted to the Treasury, 1843 April - 1845 December; Treasury authorities and directions, 1843 April - 1845 December, pp. 283, 302, 303, 304, 306, 307, 352, 353, 359, and 360. Mint Papers, The Public Record Office, Kew, Richmond, Surrey, UK. See: Societe Jersiaise Numismatic Section, Royal Mint Documents 1851 - 1861. Occasional Papers No. 7. 7. MINT 12/1, Letters and papers concerning the execution of copper coinages for the States of Jersey. 1851 September - 1852 March; 1857 December; Mint Papers, The Public Record Office, Kew, Richmond, Surrey, UK. See: Societe Jersiaise Numismatic Section, Royal Mint Documents 1851-1857. Occasional Papers No. 8. 8. MINT 1/42, Entries include: Orders of the Master, 1852 April - 1858 May; Proclamation, 1852 April; Representations, reports etc. submitted to the Treasury, 1852 January - 1858 May; Treasury authorities and directions, 1851 December - 1858 May, pp. 699, 700, 710, 711, and 712. Mint Papers, The Public Record Office, Kew, Richmond, Surrey, UK. See: Societe Jersiaise Numismatic Section, Royal Mint Documents 1851 - 1861. Occasional Papers No. 9. 9. MINT 1/44, Entries include: Order of the Privy Council, 1861 June; Orders of the Master, 1861 January - 1864 June; Representations, reports etc. submitted to the Treasury, 1861 January - 1864 December; Treasury authorities and directions, 1861 January - 1864 December, pp. 112, 113, 150, 151, 153, 157, 158, 159, 267, 268, and 273. See: Societe Jersiaise Numismatic Section, Royal Mint Documents 1851-1861. Occasional Papers No. 9. 10. J. Bertrand Payne, The Gossiping Guide to Jersey (London, 1865), pp, 197-200. From “The History of Guernsey; with Occasional Notices of Jersey, Alderney, and Sark, and biographical Sketches” by Johathan Duncan, London 1841.